How do groups of animals, including humans, make decisions that affect the entire group? Evidence collected from schooling animals suggests that the process is somewhat democratic, with nearest neighbors and the majority shaping overall collective behavior. In animals with hierarchical social structures such as primates or wolves, however, such democracy may be complicated by dominance. Strandburg-Peshkin et al. monitored all the individuals within a baboon troop continuously over the course of their daily activities. Even within this highly socially structured species, movement decisions emerged via a shared process. Thus, democracy may be an inherent trait of collective behavior. Moving animals connect our world, spreading pollen, seeds, nutrients, and parasites as they go about the their daily lives. Recent integration of high-resolution Global Positioning System and other sensors into miniaturized tracking tags has dramatically improved our ability to describe animal movement. This has created opportunities and challenges that parallel big data transformations in other fields and has rapidly advanced animal ecology and physiology. New analytical approaches, combined with remotely sensed or modeled environmental information, have opened up a host of new questions on the causes of movement and its consequences for individuals, populations, and ecosystems. 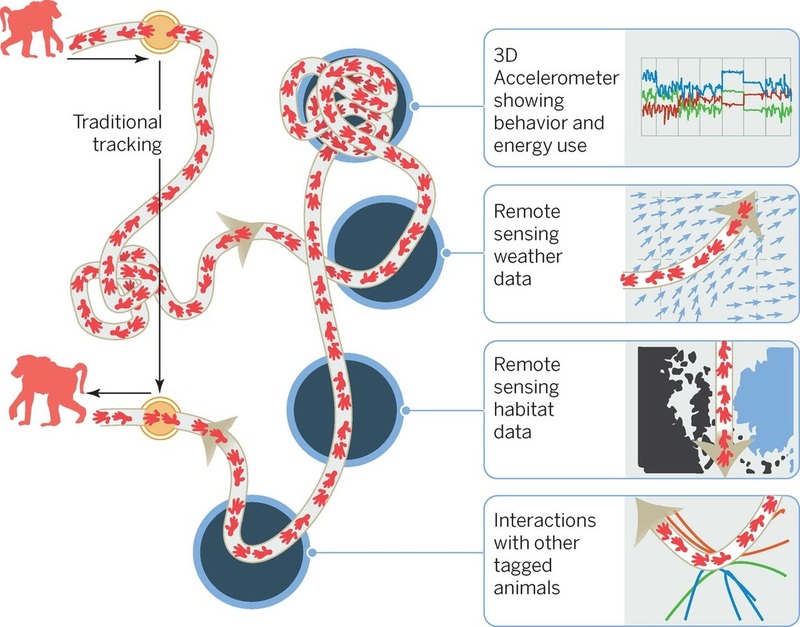 Simultaneous tracking of multiple animals is leading to new insights on species interactions and, scaled up, may enable distributed monitoring of both animals and our changing environment. We are interested in the evolution of complex social systems, and specifically, understanding how collective (group) behaviors emerge from interactions among individuals, and how group traits impact individual fitness. We use remote tracking technology in conjunction with field-based experiments and observational methods to explore group movement and decision-making, coordinated territorial defense, and other collective behaviors in primate social groups. Congratulations to Grace Davis for receiving the HIA-Tinker Summer Fellowship and a Smithsonian Tropical Research Institute Short-term Fellowship! Congratulations to Katrina Brock, Grace Davis and Tamar Boussina for winning the best poster award at the 2015 C-WESS conference.